Last month we carried a feature called Warriors With Rubber Extremities, about the sporting activities of the English Lake District. 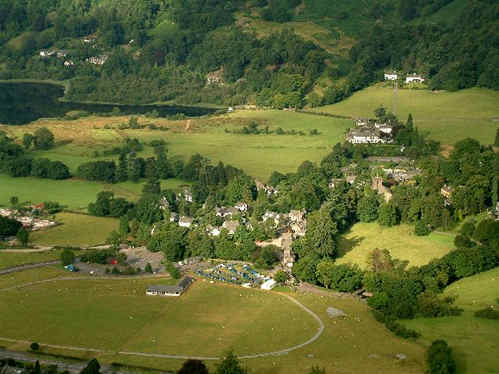 Inevitably the name of Grasmere entered the item. Recently Tony Richards walked to Alcock Tarn, and looking down onto Grasmere he took todays feature picture, which includes the sports arena. American wrestler (1953-) . Had we been invited to draw the caricature of today's subject, we think that under the circumstances we would have tried to have done a more flattering portrait: this man is big and tough, very big and tough. Standing 6'6" tall he makes a fearsome adversary. During last weekend we dined with someone who met this man in Japan: we were told that even in the land of Sumo wrestlers, he towered over everyone around, bulking with the best of the Sumos. We suspect that the size of his filmography may surprise many visitors. This entry was prepared using an IMDB (Internet Movie Database) feature. Say oh wise man how you have come to such knowledge? Because I was never ashamed to confess my ignorance and ask others. The picture of Pendower Beach in Cornwall, England was taken on a recent visit by Charles Winpenny for his CornwallCAM website. The red/orange plant in the foreground is Montbretia Crocosmia named after Antoine Francois Ernest Conquebert de Montbret, a French botanist who accompanied Napoleon on the Egyptian Campaign, though the plant is a native of South Africa. The plant name is sometimes spelled 'Monbretia', which most authorities list as an acceptable alternative. Just how Monsieur Conquebert de Montbret might feel about that is open to debate. Our own picture of Montbretia was taken on an abandoned railway running past a heavily industrialised area of Whitehaven, a town on the coast of West Cumbria, England. We went in search of the 18th century botanist Montbret, after whom this lovely plant was named, but nothing was to be found on the web. The search continues: any information from weblog visitors will be welcomed. If our own quest reveals anything we will post an update. The white flowers in Charles' picture might be Convulvulus: after the time spent trying to track down Conquebert de Montbret we dare not even think about them, or what they are named, or who might have discovered them.